Just like mini metal paintings ! The 'Sunrise ~ Sunset' Cufflinks are entirely hand fabricated. Each mini scene is comprised of a chased sterlium (a new silver alloy which resists tarnish) background highlighted by solid 10 karat yellow gold and 'framed' with mirror finished solid sterlium. 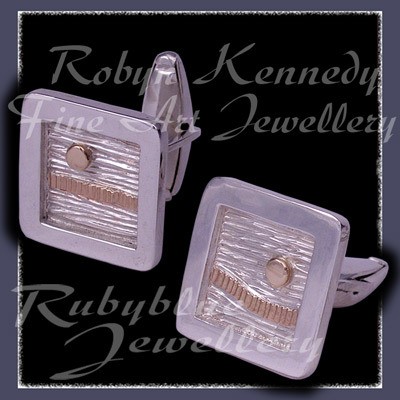 The 'Sunrise ~ Sunset' Cufflinks are secured with sterling silver cufflink findings. The 'Sunrise ~ Sunset' Cufflinks measure 19 x 19mm and have a 15 gram total weight. 'Sunrise ~ Sunset' Cufflinks $239. If you would like to commission 'Sunrise ~ Sunset' Cufflinks of your own ... please contact us by e-mail or phone at Rubyblue Jewelry. All of the jewelry showcased in the 'one-of-a-kind' collection are artist originals. To purchase the 'Sunrise ~ Sunset' Cufflinks without using PayPal, please contact us by e-mail or phone at Rubyblue Jewellery.